The Box office and critical success “La La Land” may not have won Best Picture over “Moonlight,” but it is likely to draw crowds to Cinestudio just the same. The film is the work of director Damien Chazelle, a 32-year-old filmmaker behind 2014’s sublime music film “Whiplash” among others. As the work of a favorite of the Academy, “La La Land” had long been awaited as the year’s best movie. Decades of old-Hollywood and jazz-age glory transcend time and feature into the Los Angeles of “La La Land”. The young people at the heart of the story (Emma Stone and Ryan Gosling) are each making the single life work for them, more caught up in their love of the past than in their hopes for the future. LA is, to them, a place of dreams and fantasy where only those willing to sacrifice their own personal happiness can ever achieve anything of note. Stone wants to be an actress like the legendary film stars she plasters on her walls. Gosling is an aspiring jazz pianist who is also caught in the past: the musician pines for the days when all a musician needed was drive and talent to make it. Instead, he must spend his life playing a mindless set of lifeless piano music to distracted restaurant-goers. “La La Land” rolls along at this pace for a good section of the film. Every sign points to the meeting of the two before it happens, and the laws of the romance predict that they must cross paths before much longer. Still, when Stone and Gosling finally do see each other for the first time, Chazelle employs all of his cinematic powers to make time stop. The two leads have a natural and undeniable chemistry that is clearly modeled on the Hollywood romances of the 1950’s and 60’s. The stars of those classics, though, were all hired not only because of name recognition and acting. They were professional dancers and singers too, an added set of skills that Stone and Gosling picked up and honed for these roles. They are not experts, and the faults that they show in both their vocal and dancing arrangements were allowed to remain unedited for authenticity. This reasoning may seem unusual to some, but it works soundly. The two lovers are not perfect, but why should they be? Audiences are more likely to feel empathy for people who have human failings. These imperfections of voice and step have drawn a lot of criticism. Some viewers feel that their time is being wasted if the movie yields to performances that are meant to be less-than-perfect. While their inability to sing and dance like experts lends some credibility to the idea that they are aspiring stars without much of a shot, that realism falls apart when inevitably, they each accomplish their dreams right down to the letter. 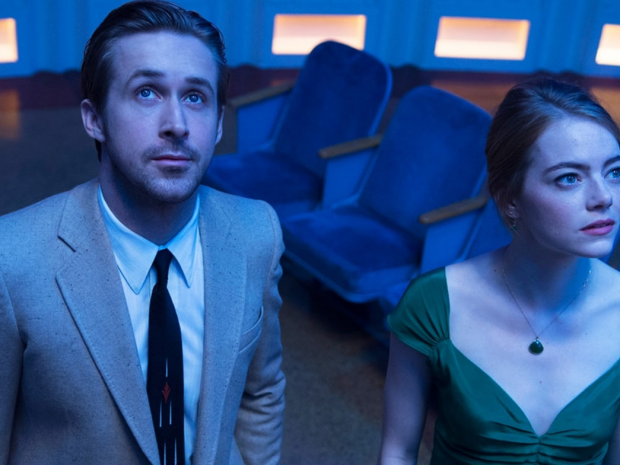 It is the film’s end that is most daring, though, and which was most likely to bewilder the audience of those Hollywood classics that “La La Land” draws so much from. It is both more and less than those films ever attempted to be: not a sprawling musical that defies the grounding rules of reality, but one that works in step with the sacrifices and ubiquitous failure that makes up the myth of Hollywood. “La La Land” may not change the way you think about musicals. Its specially crafted happy ending, though, will stay with you for a long time. “La La Land” will be shown at 7:30 on Thursday and Friday, Mar. 30 and 31, and at 2:30 and 7:30 on Saturday, April 1.